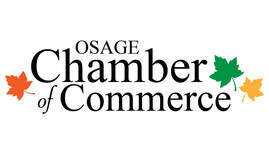 The Osage Chamber of Commerce promotes Osage as the place to do business ​and helps in providing quality of life for those who work and live in Osage. Osage - the beautiful City of Maples, will continue to strive to be industrious, prosperous, and progressive. We are committed to be a family friendly community, a community of choice for all ages, and a place that we are proud to call home. History of the "City of Maples"
The Maple tree is part of Osage's heritage. In the winter of 1855-56, Dr. S. B. Chase, of Decorah purchased land in Osage. In the spring, he and other interested parties platted the present city of Osage. The streets running east and west were generally named for trees. The streets running north and south were numbered. ​Dr. Chase, who named all the streets, was responsible for setting out the maple trees which line the streets. If people were not able to buy, he gave them trees, and even helped plant them. He had come from Portland, Maine, a city lined with trees. The glorious autumn colors ​of these maples are annually a fitting tribute to this pioneer.